Charlie Parker changed every level of jazz playing. Charlie Parker stands with Louis Armstrong , Duke Ellington, Miles Davis and a few others as one of the titans of jazz music history. He changed the both the harmonic basis and the pace of jazz improvisation. Parker's rapid-fire soloing and use of different chord intervals has had an effect on every jazz player who came later. Charlie Parker was born in Kansas City, Kansas and grew up in Kansas City, Missouri. An only child, Parker was not precocious musically and played the baritone horn before switching to saxophone at age 11. He did not have much formal training and dropped out of school at 14 or 15 to be a professional musician. In 1937, "Bird" [Parker] joined Jay McShann's Orchestra and he played the area with McShann, Lawrence Keyes and Harlan Leonard. Two patterns which influenced all of his short life were formed. Parker moved about from band to band and he abused narcotics and alcohol. In 1939 Bird moved to New York. He made his first recording with Jay McShann, met Dizzy Gillespie and held a number of musical and non-musical jobs. It is well publicized that Bird held a job as a dish-washer in a restaurant where Art Tatum [a jazz piano great] was playing. Parker's later use of blistering fast runs and sophisticated harmony suggest Tatum's influence. After leaving McShann's touring band Bird often sat in at Minton's Playhouse; played clarinet and alto with Noble Sissle's band in 1942; played tenor for 10 months with Earl Hines band in 1943; and went on the road with the original Billy Eckstine band in 1944. The sadly under-recorded Eckstine band was the first big band to feature the newly emerging jazz style that became be-bop. The Musician's Union strike in 1942 and 1943 meant that no official recordings were made. This meant the evolution in the playing of Parker, Dizzy Gillespie and others toward bebop was not recorded and heard by the listening public. In 1944, Charlie Parker made his first small combo recording on Savoy with Tiny Grimes. Later in 1944 Bird and Dizzy Gillespie and a rhythm section made revolutionary sounding be-bop recordings for Savoy. They played in unison at a very rapid meter and then soloed at equally fast pace using higher harmonic intervals than those before them had used. Jazz critics and established stars were often derisive and dismissive. Some exceptions like Coleman Hawkins and Benny Goodman were supportive. In 1945 Parker and Gillespie became mainstays of New York jazz centered on 52nd Street. They went to California together in late 1945 for a commercially unsuccessful club engagement and Bird stayed on in California afterward. He sank deeper into substance abuse, had a breakdown and spent 6 months of 1946 committed to Camarillo State Hospital. Following his release he made two outstanding recordings for Dial and returned to playing in jazz quintets. Among his sidemen were Miles Davis, Red Rodney and Kenny Dorham on trumpet; Duke Jordan and Al Haig, piano; Tommy Potter on bass; and Max Roach and Roy Haynes on drums. Bird also played intermittently with Norman Granz's Jazz at the Philharmonic beginning in 1946. He went through cycles of illness and cure in the early 1950's, although one of his greatest recordings, The Massey Hall concert with Dizzy Gillespie was recorded in 1953. His short turbulent life ended on March 4th, 1955 while he was watching Tommy Dorsey on television. The coroner thought the 34 year old Parker was in his 50s or 60s when he succumbed. 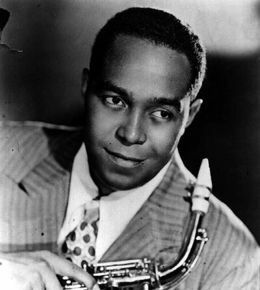 Charlie Parker changed the standards of tonality, harmony, rhythm and melody. Every jazz musician owes part of his music to Bird.